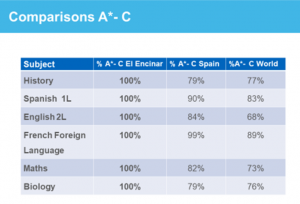 The table shows Highlands’ results compared to other Cambridge International Schools in Spain and in the World. 100% of our best students had highly-satisfactory results (Range from A*-C). Proud of our students! Proud to be Highlands!